Vanguard was once a social justice leader in one of the country’s most active nonprofit scenes. 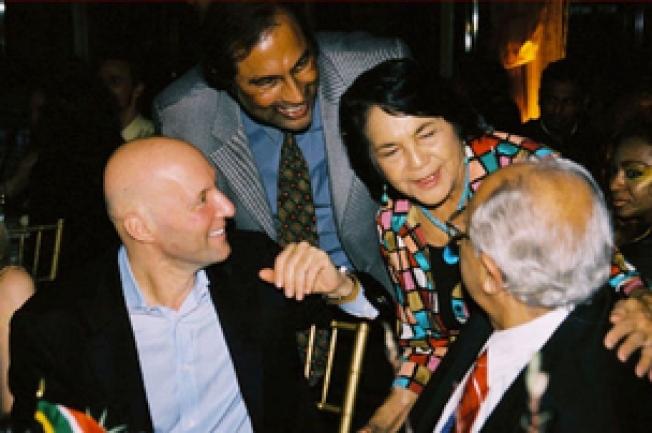 At a 2005 gala, then-Vanguard President Hari Dillon (second from left) talks with anti-apartheid activist Ahmed Kathrada (right), civil rights activist Dolores Huerta and Mouli Cohen. The sentencing of its president next month for his role in a financial scam that ensnared board members and donors will close the door on a nightmarish final chapter for the Vanguard Public Foundation. Vanguard was once a social justice leader in one of the country’s most active nonprofit scenes. The organization funded San Francisco’s massive Iraq War protests in 2003 and financed the first battered women’s shelter in the state. But its last cause was lining the pockets of a Belvedere millionaire who gained the trust of key officials at Vanguard, including the organization’s president, Hari Dillon. The 40-year-old Bay Area foundation officially shut down last year after falling victim to an elaborate financial scam by Israeli entrepreneur Samuel “Mouli” Cohen. Cohen swindled more than $30 million from Vanguard donors. In April, he was sentenced in a federal court to 22 years in prison. In exchange for the testimony that put Cohen behind bars, Dillon, pleaded guilty to money laundering and wire fraud. The criminal convictions for Cohen, 54, and Dillon, 64, represent the denouement for the foundation after years of infighting and suspicion among its members over its finances. A derelict board of directors stood by as Vanguard crumbled. Now, former staff and board members are coming to grips with the facts of Vanguard’s demise. Hundreds of pages of court documents, financial records and interviews with former board members and staff reveal that the storied foundation’s collapse was caused as much by Cohen and his greedy scheme as the charismatic president who fell for it. Board members put all their faith in Dillon, and Dillon put all his faith in Cohen, who eagerly spent their millions on expensive cars, European vacations and private concerts featuring Grammy Award winners. The details of lavish spending, embezzlement and fraud have sent shudders through the nonprofit world. The 13-member board did nothing to stop it, officials with the nonprofit acknowledge. Tracy Gary, one of the original members of the Vanguard collective and an heir to the Pillsbury fortune, said Dillon was responsible for the foundation’s downfall. “But so, too, was the culture that all of us created,” Gary said. Now besieged by civil suits, Dillon said in an interview that he has bounced from home to home for more than a year. On Independence Day this year, he sat in an aging Cow Hollow motel room, surrounded by copious notes, boxes of paper and the few belongings that aren’t locked in a storage space he can no longer afford. “It’s unquestionably a catastrophic tragedy with enormous proportions,” he said. When the foundation began as a collective in 1972, it was one of the first of its kind: a philanthropic organization founded by young heirs and heiresses, including the Pillsbury and DuPont families, who wanted to contribute their inheritances to progressive economic and social causes. “Vanguard, back in the good old days, was one of the originals,” said Geoff Green, executive director of The Fund for Santa Barbara, who served as a co-chairman of the board of directors at the Funding Exchange, a national network of foundations that followed Vanguard’s suit. Dillon made a name for himself in progressive politics in the ’60s, when he was jailed while leading the first Third World student strike at San Francisco State University, then called San Francisco State College. The protests led to the first black studies department in the country. While a student activist, Dillon forged a friendship with Danny Glover, the actor who would become famous for his roles in the movies “Lethal Weapon” and “The Color Purple,” and for his liberal activism. Dillon’s roster of celebrity endorsements, booming voice and effusive politics won over Vanguard’s mainly white donors and board members. From his hiring in 1990, former board members said, Dillon seemed prone to flashy events that attracted attention, but also required a lot of money. Some board members lauded his leadership, while others found his actions inappropriate. In 1993, Dillon threw Vanguard’s 20th anniversary celebration in the ballroom at the Hyatt Regency, flying in keynote speaker Harry Belafonte, actress Whoopi Goldberg, author Alice Walker and performers Carlos Santana and Joan Baez, some on private jets. Soon after South African civil rights leader Nelson Mandela’s release from prison, some board and staff members became alarmed when Dillon arranged a personal trip to South Africa for himself and other anti-apartheid activists and had $40,000 of Vanguard money wired to his personal account. Dillon claimed the funds were for armed security, drivers and group meals and that Vanguard donors agreed to pay the money back. Over time, former staff members said Dillon began to have strawberries and newspapers delivered to the office, hired a personal driver and paid for expensive hotel stays, dinners and private jets. Board member Rob McKay, a Taco Bell heir, helped Dillon invest some of Vanguard’s funds in tech startups. Some of the investments paid off, making board members less leery of the investment Dillon would make next. In 2002, actor Glover introduced Dillon to Mouli Cohen. Charismatic and dapper, Cohen touted his successful entrepreneurial endeavors, including the tech startup Ecast, a digital jukebox service for bars and nightclubs. He hosted parties at his mansion in Belvedere, where he regaled potential investors with stories of his financial prowess and entertained with elaborate meals served by butlers and wait staff. He led tours through his personal art gallery, which included reproductions of Matisse and Picasso paintings that Cohen claimed were originals. Federal authorities said Cohen had hired a professional artist to reproduce the masterpieces, including fake gallery labels, in exchange for fake Ecast stock. Cohen told Glover and Dillon that he thought highly of Vanguard and wanted to give back to his community. He offered them an opportunity: Within six months, he said, Ecast would be acquired by Microsoft, a deal that would make him millions. Cohen said he was willing to sell them some of his founder’s shares, but he warned they could not share news of this deal with anyone until it became official; the deal was tantamount to insider trading. Dillon almost immediately agreed, court records show. So did Glover, who did not respond to requests for comment for this article. But the deal wasn’t true. Cohen continued to entice board members and donors into giving him more money while telling them the deal was imminent. Dillon asked Vanguard donors to pitch in $6.2 million with the assurance from Cohen that their funds would grow to $60 million. Cohen continued to string along the board for years, records show. Dillon, meanwhile, was skimming money. According to his plea agreement, Dillon admitted to keeping $2.5 million from payments donors made to Cohen. He told prosecutors that he used the stolen funds to pay off his American Express bills and planned to pay the donors back with profits from the Ecast deal. By 2007, word had spread among foundations across the country that Vanguard was failing to fill grants. Questions about missing funds prompted the Funding Exchange to cast Vanguard, one of its founding members, out of the network. By 2008, board members began to admit they had been negligent in their oversight of Vanguard and its president. In frenzied meetings, they brainstormed ways of escaping liability and estimated that the organization owed more than $1 million. Meanwhile, Cohen was using Vanguard’s money to fund what U.S. District Judge Charles Breyer would call an “obscene lifestyle.” Over the years, he spent more than $6 million on private jets, $1.4 million on a diamond ring and more than $600,000 on a Rolls-Royce and Aston Martin. Cohen continued to insist the Ecast deal was still on when Dillon asked him to reconsider the Vanguard donors’ investment. When Cohen continued to offer more excuses for the delay, Dillon broke their confidentiality agreement and asked McKay, the former board member, to meet with an Ecast executive. McKay learned that the deal had never existed and that Ecast had severed ties with Cohen in 2000. Last year, the IRS revoked Vanguard’s nonprofit status. Earlier this year, former Vanguard supporters began raising money to fill at least 24 unpaid grants. The money, the supporters promised, will go only to the grants. Reyhan Harmanci contributed to this report. This story was edited by Robert Salladay and Mark Katches and copy edited by Nikki Frick and Christine Lee. The Bay Citizen is part of the independent, nonprofit Center for Investigative Reporting, the country’s largest investigative reporting team. For more, visit www.baycitizen.org. Contact the reporter a swalter@cironline.org.